A spate of high-profile and costly payroll failures has shone a light on compliance in this business-critical function. Is it time to review what your organisation has in place? You possibly saw the headlines or perhaps laughed at the punchlines from late night talk show hosts when celebrity chef George Calombaris’ restaurant group was found to be paying staff incorrectly over a long period, leading to $2.6m in back payments. However, given that some employees were also overpaid, the general consensus was that this was an honest mistake – and as poor an excuse as it sounds, Calombaris himself never claimed he was an accountant or payroll professional; he was merely a chef. Indeed, an independent review found that outdated systems and processes were to blame for the discrepancy in payments that did not meet the latest industry awards. While it was a regrettable – and costly – error, Calombaris is unlikely to see any lasting damage to his organisation’s reputation, primarily because he has proactively sought the assistance of an external auditor to help rectify the situation. 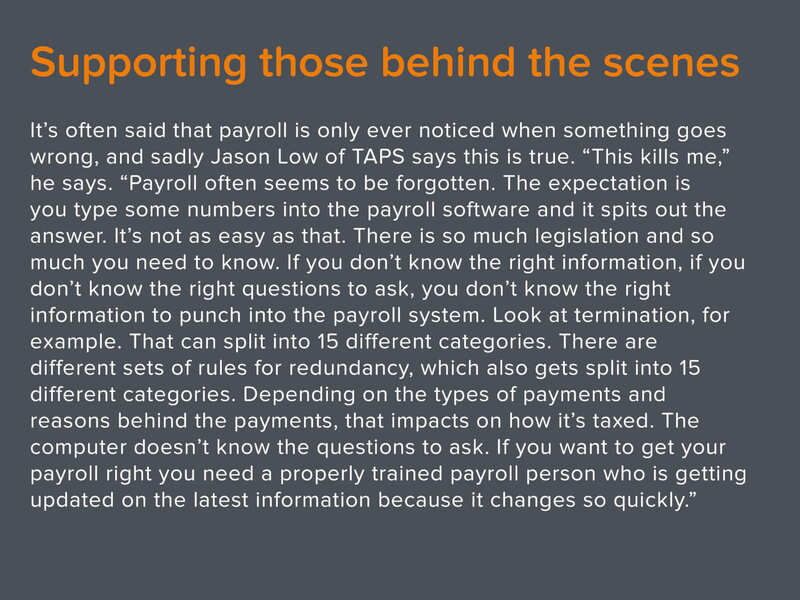 However, it’s these kinds of payroll errors that Jason Low, head of TAPS (The Association of Payroll Specialists) sees time and time again. From something as innocuous as an out-of- date system or a failure to keep abreast of changes to awards, through to outright fraud, compliance (or lack thereof) has emerged as a topic of note recently. Compliance means more than just changes dictated by the Australian Tax Office. There may also be requirements from Fair Work Australia, such as the recent 3.3% increase to the minimum wage, and additional tweaks to superannuation and workers’ compensation. While many of these will typically occur at the start of a new financial year, Low says in reality changes can occur at any time. Add in already-complex individual awards, and industries that hire a high proportion of casuals, contractors and freelancers, and mistakes are almost bound to happen. Looking ahead through the rest of 2017, Low says further changes can possibly be expected to penalty rates. Meanwhile, the ATO is introducing Single Touch Payroll – a government initiative intended to streamline business reporting obligations – in a number of phases from 1 July 2017. One key mistake that too many organisations make is to assume that out of sight means out of mind – in other words, because the payroll function is outsourced to a third party, the employer washes its hands of compliance issues. This is not the case. In addition to the obvious requirements around legislative compliance, organisations that outsource payroll to service organisations also face the risk of not being able to extend the same level of internal controls to the service organisation. “With payroll being one of the most important, if not the most important, functions, controls assuring the completeness, accuracy and integrity of the process are very critical,” says Anij Janardhanan, Head of Global Compliance, Ascender. Janardhanan adds that the ability of a service provider to demonstrate an effective control framework based on full understanding of inherent risks in payroll processes through independent auditors’ reports like ISAE 3402 SOC1 (International Standard on Assurance Engagements (ISAE) No. 3402, Assurance Reports on Controls at a Service Organization) is critical. Similarly, he says business continuity and disaster recovery of the payroll services and systems are often overlooked, with no back-up for payroll data. Availability of back-up personnel with the right skills and capabilities in the absence of primary staff is also critical to the success of any business continuity program. While this has been a very familiar challenge for in-house payroll departments, outsourcing payroll adds little value in mitigating this risk if the provider does not have enough breadth and depth of talent pool to be used for contingencies. The ‘elephant in the room’ for all payroll professionals, whether they work in-house or as part of an outsource consultancy, is data privacy. Low says this is a critical issue for outsource payroll providers. It is also important to understand that information security does not just stop at privacy. For example, ensuring that access to perform transactions is limited to only authorised personnel is a key priority for a financial process such as payroll. “Data privacy is ensuring that personal information is collected, used, retained, disclosed, and destroyed in conformity with the commitments in the entity’s privacy notice and applicable legislations. In addition to managing the privacy requirements, a mature payroll provider should also be able to manage confidentiality, security, availability and processing integrity for its customers’ payrolls,” says Janardhanan. The Office of the Australian Information Commissioner provides some excellent guidelines for Australian businesses on its website (www.oaic.gov.au). Information security is a much broader domain, and there is significant interest in the security of data being stored in the cloud. “Data privacy and security concerns are often more significant when there is a service organisation involved in the payroll process with technology and personnel outside Australia,” says Janardhanan. Ascender uses a multi-tiered approach to managing compliance by sourcing legislative and data privacy updates from leading firms and providers and combining that with Ascender’s in-house capabilities to interpret and apply in a timely manner. Ascender has also appointed dedicated personnel at leadership levels to drive other aspects of compliance, like data privacy, information security, business continuity, etc. “At Ascender, we are trusted with the prosperity of millions of employees,” says Marjukka Mäki-Hokkonen, CEO, Ascender. Low is keen to shift the standing of the payroll function in businesses away from a function that costs money to one that can potentially save money. He cites an example of one of his members who recently started a new payroll job. One of the first things he did was examine the parameters of the payroll system, to get a feel for what was happening. He noticed that in the past six months multiple redundancies had been made. These redundancies were pegged in the payroll system as being subject to payroll tax, which is a tax that companies must pay based on the size of their payroll. Spotting this mistake and making the necessary changes, the new hire was able to save his company $30,000. This article was originally published on HRD Magazine. To access the article, please click here.